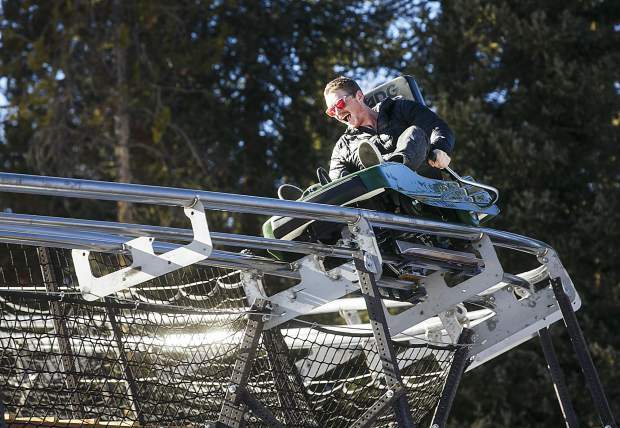 A thrill seeker rides on the Rocky Mountain Coaster at Copper Mountain Resort Thursday, Nov. 30, next to the base of American Flyer chairlift. 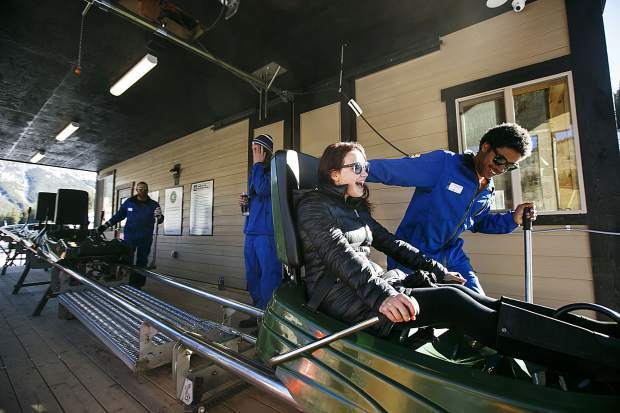 Copper Mountain employee help launch a costumer onto the Rocky Mountain Coaster at the resort Thursday, Nov. 30, next to the base of American Flyer chairlift. Skiers, snowboarders and non-shredders alike will have the opportunity to take a different kind of a turn down Copper Mountain Resort on Friday when the resort opens its new Rocky Mountain Coaster. 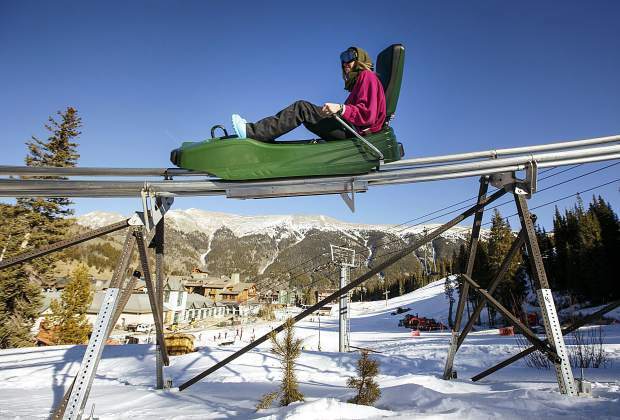 At Copper on Thursday, skiers seated on the American Flyer chairlift and skiing beneath it glimpsed across and up at the 5,800-foot alpine coaster track as resort employees got an early chance to zig and zag atop steel through Copper’s mountainous terrain. 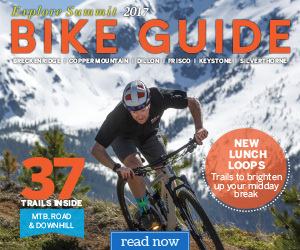 The ride consists of a vertical drop of 430 feet as its track runs along the natural curvature of the mountain, dipping into 360-degree turns down to Copper’s high alpine Center Village. The coaster will open from 11 a.m. to 3 p.m. on Friday and 11 a.m. to 4 p.m. on Saturday and Sunday, weather-permitting. Prather added that the ride initially will only be open for weekend dates. To board the ride, guests need to be at least 9 years old. Children between the ages of 3 and 8 who are at least 36 inches tall may ride as a passenger with someone 16 or older. To ride solo, guests must be 52 inches tall. Copper is currently listing a single solo ride at $25, and a two-ride pass can also be purchased for $35. Resort passholders receive a discount of $5 off of a single ride plus one additional $20 ride for friends or family. The ride, which was created by the Aquatic Development Group, features an average 11 percent downhill grade which allows the carts to reach a maximum speed of 25 miles per hour. The coaster’s carts also feature manual hand brakes to give riders the freedom to go at their own pace. The coaster is located just west of the resort’s American Flyer lift.